Some Jews would come from Galicia, then a province of Austria-Hungary, and from Romania, but most came from the Russian Empire. In the late 19th century, enlarged by its acquisitions of much of Poland, including Lithuania, Russia was home to the world's largest Jewish population. Imperial Russia restricted Jews without special permission to residing within the Pale (the boundaries) of Settlement. Five million Jews lived there, nearly all in towns (shtetlach) and villages, for even within the Pale, cities like Kiev were closed to Jews. Russia would let Jews who had become more "Russian" live outside the Pale of Settlement. That could be done by conversion to Christianity, then by higher education - but quotas of five percent Jewish enrollment limited that option. Army service was also a way "in", but conscription was dreaded. It would take boys into a hostile setting that would try to convert them. But Russia had no objection to its Jews leaving. Though Jews faced more restrictions than others, these were hard times all but the wealthy, Jew and Gentile. Jews looking for a land where they could, at last, be full citizens, began the first aliyah to then Palestine. It is testimony to the Jew not seeing himself a citizen and not being seen as one, that a Jewish immigrant, whose family may have been in Poland for generations, would be called a Jewish American and where he lived would be known as a Jewish neighborhood. Yet a Polish Catholic immigrant would be called a Polish American and live in what would be called a Polish neighborhood. in many provinces the Jewish population under 15 percent. To compare maps of Europe in 1890 and 1930, click here. The pogroms that began in 1881 after the Tsar's assassination would lead to massive departures. In what is called the first aliyah some Jews would leave for Ottoman Palestine. Many would go to England or Canada. 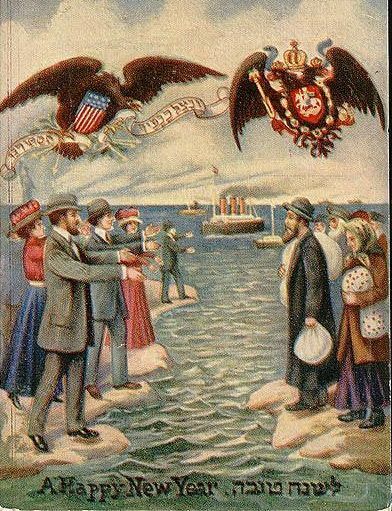 But most would leave for the United States where there were few barriers to entry, a growing economy, and relatives and others from their old home towns (landsmen) who would welcome them. All across our nation, communities of Jews from eastern Europe began to form and grow. As the stories of economic opportunity and religious freedom in Die Goldene Medina (the golden land) made their way back to the shtetlach and the villages, others were encouraged to come. Thus, Jewish immigration would increase each decade. Rosh Hashanah greeting card from the early 1900s. beckoning them to come to the United States. These were the years when most ethnic communities - Poles, Russians, Slavs, Italians, Hungarians and more - were formed in Cleveland, which by 1920 would be America's fifth largest city. Jewish workers were welcomed into a garment industry (see ECH), largely owned by "German" Jews, that was almost as large as New York's. Cleveland offered Jewish immigrants better living conditions than New York's Lower East Side and it provided support from social welfare agencies established by the children and grandchildren of the first wave of Jewish settlers. Jewish immigration would be almost completely shut down by widely supported measures whose aim was to cut down on all immigration from eastern and southern Europe. First, in 1917 admissions standards were raised and a literacy test imposed. Then a 1921 law, the Emergency Quota Act, limited the immigrants from a country to three percent of the number from that country who had lived here in 1910. For persons from eastern or southern Europe it was a 75 percent reduction from prior years. Last, the 1924 National Origins Act rolled back the base year to 1890, when few southern or eastern Europeans were here, and cut the percentage to two. The combined limit for eastern and southern Europe was now less than 22,000. But by 1924, 2.5 million Jews had arrived. Twenty-five percent of the world's Jews now lived in the USA. Unlike other immigrant groups, where as many as one-third might return home, few Jews would go back to the "old country." Cleveland's Jewish population grew almost 30 fold, from 3,500 in 1880 to 100,000 in 1920. Now we look at the story of one of these families: Sam and Minnie Klausner.